Obituary for Velma Arlene (Youngberg) Hanks | Crandall Funeral Home Inc.
Velma Arlene Hanks, age 90, passed away Wednesday, August 29, 2018. She was a long time resident of McKinnon, Wyoming. Velma was born June 30, 1928, and raised in Lyman Wyoming. She was the daughter of Adolph and Alice Youngberg and was the oldest of 6 children, brothers Robert, Wesley, Jerry, Lamar, and Dan. Velma was a strong, beautiful, smart woman who married the love her life, Earl Hanks. They moved to McKinnon, Wyoming and began their life together, raising their family. She was an extremely talented and accomplished quilter and enjoyed sharing her creations with her family and friends. She enjoyed crocheting, reading books and cooking while providing for her family. 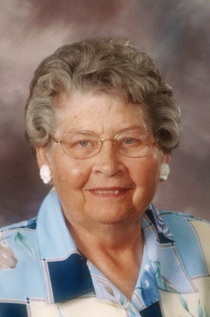 Velma is survived by her three sons, Larry Hanks and wife Patty of McKinnon, Wyoming, Kenneth Hanks and wife Bonnie of Green River, Wyoming and Clyde Hanks and wife Michelle of McKinnon, Wyoming; one brother Dan Youngberg and wife Charla of Lyman Wyoming; 14 grandchildren, 32 great grandchildren and 9 great-great grandchildren. She is preceded in death by her husband, Earl Hanks of 66 years, granddaughter Jessica Hanks, parents and bothers Robert, Wesley, Jerry and Lamar. Velma was a devoted member of the Church of Jesus Christ of Ladder-day Saints and relied on her faith to guide her through life. She had a strong testimony and love for her Savior and Heavenly Father. Funeral services will be at 11 a.m. Tuesday, September 4, 2018, at the McKinnon LDS Church with a viewing starting at 10 a.m. Interment will follow, at the Lyman City Cemetery.